Hunters Estate Agent is delighted to present 8 Ardagh Crescent for sale. 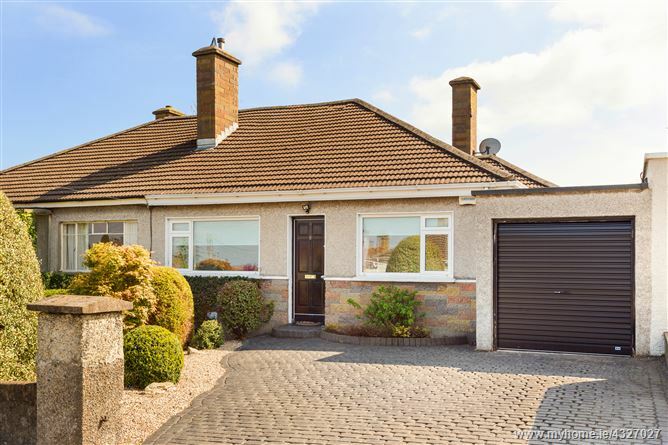 Discreetly nestled off Newtownpark Avenue in Blackrock, Ardagh Crescent is a mature residential area close to all the amenities a busy family would ever wish for. 8 Ardagh Crescent is a fine semi-detached bungalow, extending to c. 94 sqm / 1011.8 sqft that has been very well maintained over the years and offers scope to remodel and extend (subject to the necessary planning permission). Accommodation briefly comprises of an entrance hallway, kitchen, dining room, living room, bathroom, two generous double bedrooms the master benefiting from an ensuite and one single bedroom. There is also a garage. Outside, to the front there is ample off-street parking bordered by mature flower beds and hedging. There is a large rear garden enjoying a sunny decked area that is not overlooked, ideal for al fresco dining or quiet relaxation in the summer months. There is the added bonus of an astro turf and a putting green. Ardagh Crescent can be accessed via both Carysfort Avenue and Newtownpark Avenue in Blackrock. It is within easy reach of Blackrock, Foxrock, Deansgrange and Stillorgan Villages all of which offer many dining choices, boutiques, local stores and supermarkets. There are several local sports facilities including local rugby, soccer, GAA, tennis and hockey clubs all within walking distance. Marine pursuits are available at the nearby Dunlaoghaire Harbour. There are several schools in the area including Blackrock College, Willow Park, Sion Hill, Loreto College Foxrock, St Andrews College, Hollypark national schools, Carysfort national school, Colaiste Eoin and Colaiste Iosagain. The area is well serviced by transport links including the DART at Blackrock Village, the N11 (QBC -, Dublin Bus routes 145, 46A, 84, 7 and 7A). The M50 and LUAS (at Sandyford) are easily accessed. Floorplan for identification purposes only – not to scale. Alarm panel, ceiling coving, tiled flooring. Range of fitted wall and floor units, worktop, stainless steel sink unit, tiled splashback, four ring hob, double oven with provision for microwave and provision for dishwasher. Recessed lighting, Velux window, double doors to living room. Opening to conservatory. Tiled floor, Velux window, recessed lighting, ceiling fan. Double doors to garden. Solid timer floor, fireplace with gas fire insert. Built in shelving and storage unit. Fully tiled, w.c., pedestal wash hand basin and bath incorporating shower attachment with shower screen. Built in wardrobes, carpet and ceiling coving. Shelved hotpress with factory lagged cylinder and Baxi gas boiler. Fully tiled, w.c., pedestal wash hand basin and shower unit. Fitted wardrobes, ceiling coving and carpet. Garage with roller door and vehicle access to front drive and door to rear garden. Fully plumbed for water and electricity. Extending to 11sqm / 118.4 sqft. To the front there is ample off-street parking bordered by a gravelled flower beds with mature hedging. To the rear there is a sunny south easterly garden with deck area and storage shed. The garden is not overlooked and benefits from astro turf and putting green. Very well presented family home. Extending to c. 94 sqm / 1011 sqft. Nestled in mature residential area. Potential to extend / remodel (subject to necessary planning permission). Sunny south easterly rear garden complete with astro turf and putting green. Close to local amenities to include schools, shops and sports facilities. Well serviced by transport links including DART, N11 (QBC), M50 and LUAS. Travelling down Newtown Park Avenue from the N11, take the 2nd left onto Ardagh Drive. At the junction, turn left to stay on Ardagh Drive and take the next left onto Ardagh Crescent. No. 8 is on the left hand side. Strictly by prior appointment with sole selling agents. Hunters Estate Agent Foxrock on 01 289 7840. or email: foxrock@huntersestateagent.ie .